Hydrate yourself with our creative line of insulated Bottles. The fashionable graphics and unique design of these bottles are created for durable and safe use. The double walled insulated technology, easy-to-carry comfort handle, and extensive color selection create the perfect beverage/food holder. All Mana bottles are water and leak proof, non toxic, BPA and Phthalates Free, ice friendly, easy to wash/use, and trendy. The build of these Mana bottles allows them to fit easily into any purse or backpack for on-the-go hydration. WATER LEAK PROOF - The sturdy stainless-steel lid cap that is food grade material ensures that liquid will not seep out of the bottle. It's safe to put inside your school bag or hiking backpack. NON-TOXIC - This water bottle is made with 18/8 stainless-steel food grade material that's BPA Free, lead free, and phthalates free. No harmful chemicals will contaminate your drink. 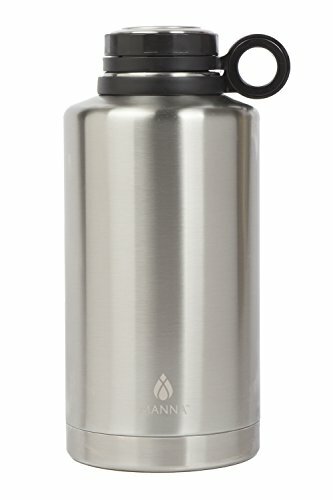 HIGH-QUALITY VACUUM INSULATION - Manna's refreshing vacuum and double walled insulated technology keeps your drink steamy hot for 12 hours and cold beverages icy cool longer than inside a plastic bottle. DRINK ON THE GO - A convenient source of hydration, the narrow lid design allows you to grip the bottle easily. Hold it while jogging or strolling by the beach! Vogue bottles fit into most car cup holders. DURABILITY YOU CAN TRUST - Easy to carry and hard to break. This bottle is made from high-quality 18/8 stainless-steel material that's widely recognized for its durability. INSULATED: The Manna Ring Growler is made with double layer insulated vacuum walls for maximum temperature retention. This will keep your beer icy cold and freshly carbonated for up to 24 hours or hot beverage for piping hot for up to 12 hours. DURABLE: Made with Stainless Steel, your Growler will last you a lifetime. The matte non slip finish will ensure the grip you need to hang on to it safely while enjoying yourself to the max. KEEPS HOT BEVERAGES TOO: The Ring Growler will not only keep your drinks cold but also you hot coffee or tea fresh off the fire for up to 12 hours later! SAFE: Being BPA and Lead free, this bottle is eco friendly and safe to use. Toxic chemicals should be the least of your worries when simply enjoying your cold or hot beverages amongst your friends. Ceramic Swing Top Growler with Wide Loop Handle - Matte Black - 64 oz by Portland Growler Co. Ceramic Swing Top Growler with Sprocket Handle - Gloss Blue - 64 oz by Portland Growler Co.